Homemade jams and chutneys, and home cooked pestos – these are culinary delights to spoil your loved ones. And they are great hostess gifts and small presents when seeing relatives, visiting friends or want to light up the day of one of your colleagues. 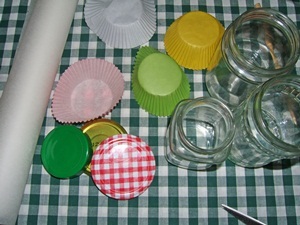 The delicious home made food n the jam jar can be decorated – with colourful lids, decorations, jam jar labels and tags. In this report we have collected ideas, inspirations, tutorials and patterns on how to decorate, embellish and sweetly package jelly and jam jars. These are great ways to turn delights to the palate into a feast for the eyes. The quickest way to spice up the design of your jar is by using a cupcake liner. Who would have thought how you could use these practical, colourful muffin cases in versatile ways. The best way to adorn jam jars with cupcake baking cups is when the liners are about the same size as the lid of the jam jar – a typical muffin liner has a diameter of 5cm. 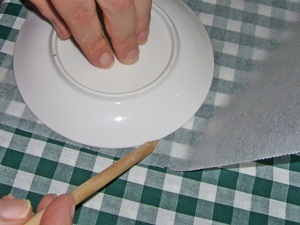 We used a second round paper under the muffin case – we used a round circle which we cut out of white baking parchment. To draw a circle use a small plate or bowl, draw around and cut out. Put the paper on the lid and form, put the cupcake baking cup on top. Take a string and put it around the neck of the jam jar and make a bow. Now the hat sits perfectly on top of the jam jar. You can go on to garnish the lid a little more – we use a crochet heart, made with the heart pattern Maria. You could use a paper flower or gift tag as adornment. You can directly write onto the cupcake liner. The nicely packaged content can be written on the lid. You can add a label to the jar. As you usually use cupcake liners on smaller jam jars, we prefer to add labels which you add like tags to the lid of the jam jar. For those who like to gift home made wild garlic pesto in a jar, we have created something special. For this occasion we have designed matching labels, you can download wild garlic pesto tags here. 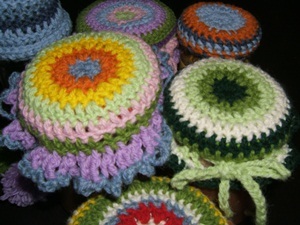 I you want to have lid covers that exactly match each lid size you can go for crochet lid covers. 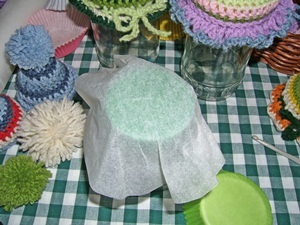 Of course you can do single-coloured lid covers – but we like to go all colourful and use up the stashes of yarn. For all who know how to crochet we will quickly write up how we did the round lid adornment (detailed step-by-step instructions for crochet circles are available with the diy kit felted bag Gemma). When you have reached the size of the lid, normally crochet the following rows until you have reached the neck of the jam jar. At this height you make of row with holes – e.g. crochet 2tr normally, make one chain. This will be the row where you can put the string to attach the lid cover to the lid. Those who love kitsch as much as we do, can add a ruffle to their lid cover. There are many ways to do ruffles - when you like to use double crochet (US: single crochet) make the rows this way: stitch one double crochet normally, in the next chain stitch two double crochet. 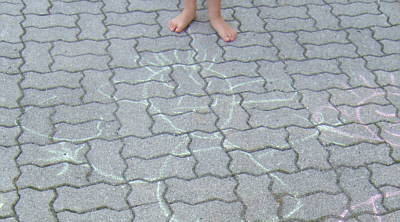 Make two or three rows like this. 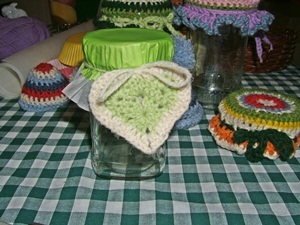 Do you see the colourful jam jar lid cover with the lilac ribbon? After the row of "holes" I did crochet 1tr in every chain of the row before – in between every tr I did make a chain. The last row in blue was one dc, 4 chains. 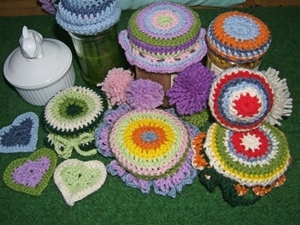 You can test new crochet patterns when you decorate your lid covers or even try to invent your one ruffles. Being creative, enhancing your crochet abilities, reducing your wool oddments and dressing up a dear little present. That is a real win-win situation.